Valerie Roybal was born in Santa Fe, New Mexico, and currently lives and works in Albuquerque. She spends much time working on art, admiring the great outdoors, keeping bees, and searching for inspiration at flea markets and vintage shops. Her artwork has been shown in a number and variety of exhibitions and venues including The 2nd National Book and Paper Arts Biennial at Columbia College Center for Book and Paper Arts in Chicago, Tributaries and Unraveling Tradition at 516 ARTS in Albuquerque, and Biennial Southwest ’08 at the Albuquerque Museum of Art and History. 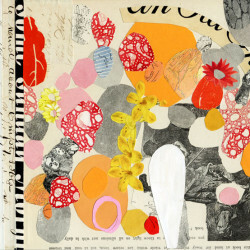 Her work can be seen in the books Cutting Edges: Contemporary Collage (Gestalten, 2011) and CUT and PASTE, 21st Century Collage (Laurence King Publishers, 2011). She is documenting her cancer experience through art and her online journal.